For more than 50 years Jack Rogers has offered the finest, most affordable, resort fashion styles for all seasons. 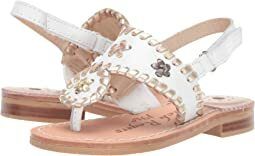 All Jack Rogers sandals are made of the finest materials to ensure that kid's feet are as stylish and comfy as they can get. Girls are guaranteed to stand out in style with any of the Jack Rogers kid's shoes. The Jack Rogers brand first rose to fame in the 1960s as a resort favorite in Palm Beach. 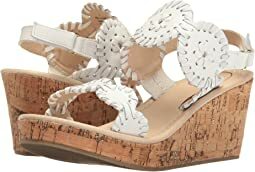 It has since grown to include a full line of girl's footwear that embodies the all-American, chic style that Jack Rogers kid's shoes are known for today. Create a look that's beach chic and perfect for any occasion with Jack Rogers kid's footwear. These are my daughter’s favorite shoes! For my 5 year old, the pink color is great and they are durable. We have been buying these for years and she wears them everyday weather permitting. These are adorable and perfect for summer, but they do run a little narrow and also about a size small. My daughter currently wears a size 1 in most brands but had to order a 2 in these! So so cute! I bought the gold ones for my daughter last year and the Platinum sandals this year.....They both read gold to me with the only difference being the gold are more yellow. The Platinum is the more neutral of the two. They do run a half size small so size up. 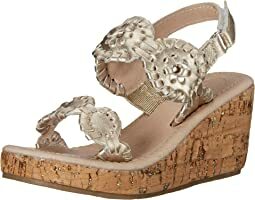 Sandals are great; the quality is as you would expect from Jack Rogers. I had to send back the first pair I ordered and order a size down. These still seam a little long but I think my daughter will have no problem wearing them all Spring/Summer. (She wears a 2 in sneakers, I had to order a size 1 in these sandals). Super cute, and the gold color is nice. Really cute. I wear a women’s 6 and these kid ones fit great! Adorable! My seven year old loves these sandals! We got the platinum - pretty shade! She feels so grown up in her sandals-just-like-mommy. They are sweet, comfortable, and a treat for her feet! Highly recommend! I love these shoes and wish they came in adult sizes. This is our second purchase as little sister wanted the same shoes as her big sister. Both girls love them! They fit well, are great quality, and are easy to walk in. Love this sandal however mine broke after ~2 years. Wish they lasted a bit longer but cute and got good use. Will order again. I bought these for my daughter in March for her to wear on Easter. She has only worn them a hand full of times as they are pretty uncomfortable for her. They are very narrow and have no arch support. They also rub a little on the sides of her feet. After about 3-5 wears they are worn and falling apart. The pink has faded and the stitching is unraveling. These are so cute but I don’t recommend these. Our 7 year old Granddaughter never took them off. The only thing my daughter wanted for her 6th birthday was a pair of heels. She is tiny and there were limited options in a size 10. These shoes fit true to size. They are super cute and she LOVES them! Now I just need a pair in my size. Love these shoes! They started making them a little different and at first I wasn’t sure they were real. They have a new bottom that is rubber so less slipping, which is great! And the leather part that goes around your feet is not as tight, my feet slid right in. I am normally a women’s size 5 but ordered these in a kids 3 and they fit perfect! I have the platinum and gold and rose gold is next on my list! Ordered typical size but could have ordered 1/2 size down, because these were too long. Very cute shoe, but had to return. Perfect dressy wedge!!! Fits true to size. Love these shoes but they are WAY too wide for all three of my girls. Jack Rogers needs to make children narrow! This is the first year my 12 year old can wear them because she has finally bumped up into the women's size and can order narrow. I ordered these for my 3 year old to wear with dresses on Florida trip and they were perfect. She loves them and wears them around the house all the time. No complaints from her about discomfort. My daughter is a jack fan, but didn’t like this shoe. Too tight between her toes. Cute style but will be returning these. My daughter loves these and gets them every year. This year they were really wide so we are returning them. In the past, they have been our go to shoe because they fit her narrow foot. Not sure what the change is, but the rose gold does look great.